For many years Charles & Ray Eames busied themselves with the search for a seat form which perfectly adapts to the human body. Following various attempts with plywood and sheet aluminium the pair finally returned to fibreglass, a material which Charles Eames, together with Eero Saarinen, had employed for their Organic Chair - also known as Conversation Chair - an object created in context of the 1940 "Organic Design in Home Furnishings" competition organised by the New York Museum of Modern Art, MoMA. However, it was only towards the end of the 1940s that production technology was advanced enough to allow fibreglass chairs to be produced economically and in large numbers. 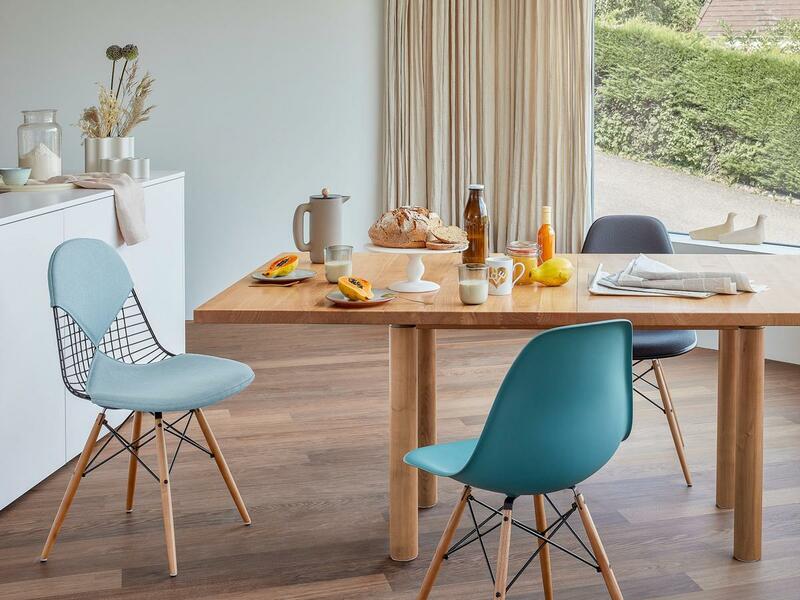 In 1950 the Eames fibreglass chair shells were released on to the market in two forms, the A-shell with armrests and the S-shell without: at that time a revolution, today a much loved design classic. The true genius of Charles and Ray Eames however was to be revealed in the next step. After forming the shells the designer pair created a range of interchangeable bases: the rod base (four-leg frame with wire struts), wooden base (wood frame), X-base (four-legged steel tube frame) and cast base (five-star base in die-cast aluminium with wheels). In 1955 the collection was expanded with a stackable base. 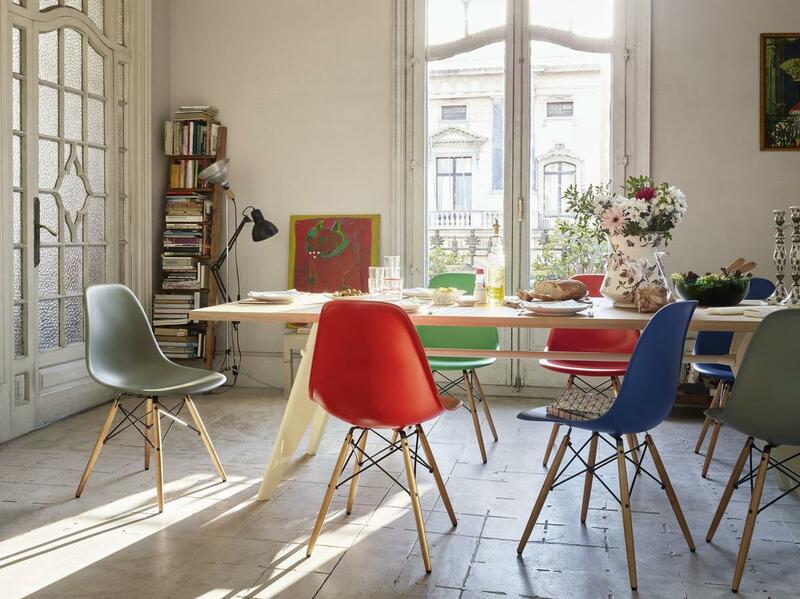 Thus Charles and Ray Eames created a chair family in which the base can be selected to match location and intended function while the seat retains the same familiar, comfortable, shell form. Charles and Ray Eames also designed a simple nomenclature for their new fibreglass chair collection. 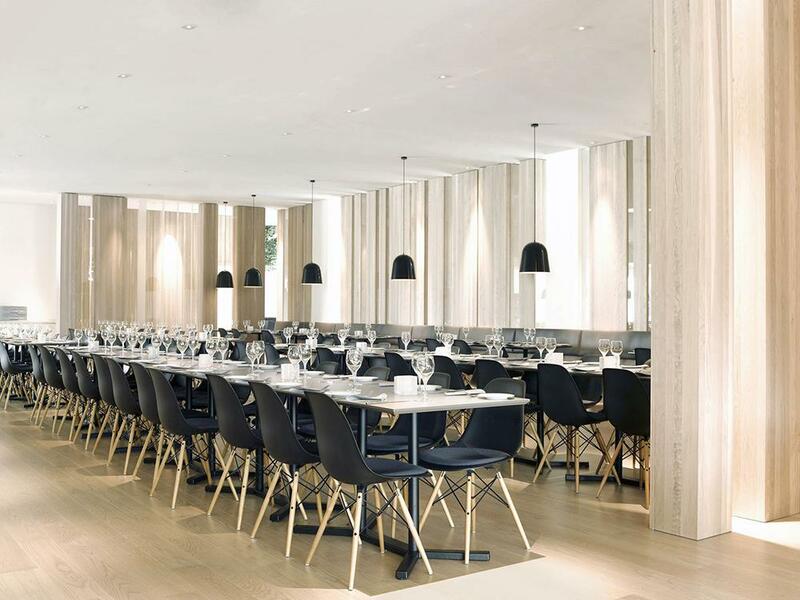 The Eames DSR chair, for example, stands for Dining height Side chair Rod base - the DSW for Dining height Side chair Wood base. Both chairs have the same S-shell, but different bases. Likewise, the nature of the DSX, PACC or DAW can be derived from the name. When in 1957 Vitra acquired the license to produce the works of Charles and Ray Eames in Europe, the fibreglass chair collection was already well on its way to becoming a genuine classic of 20th century furniture design. In 1992 both Herman Miller and Vitra discontinued production of the fibreglass shells and switched production to polypropylene: design and form remained the same, however the environmental impact of production and waste disposal was greatly reduced. 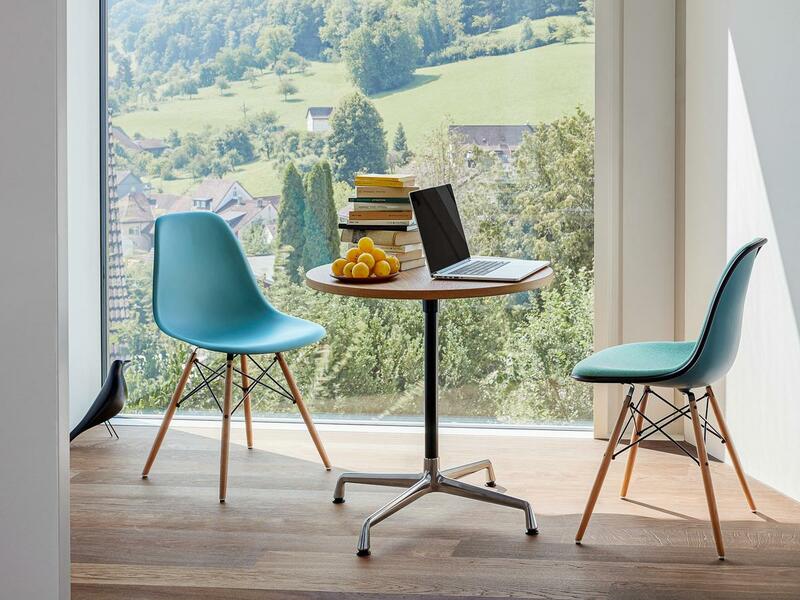 With their high, flexible backs, deep seat Vitra Eames chairs profiles and waterfall front edges the collection provide for an extremely comfortable sitting experience - be it for a few minutes in the office, a little longer over lunch or the duration of an evening concert. With the Vitra plastic chair family Charles and Ray Eames achieved one of their principle design goals: "The most of the best to the greatest number of people for the least."